Hi everyone! 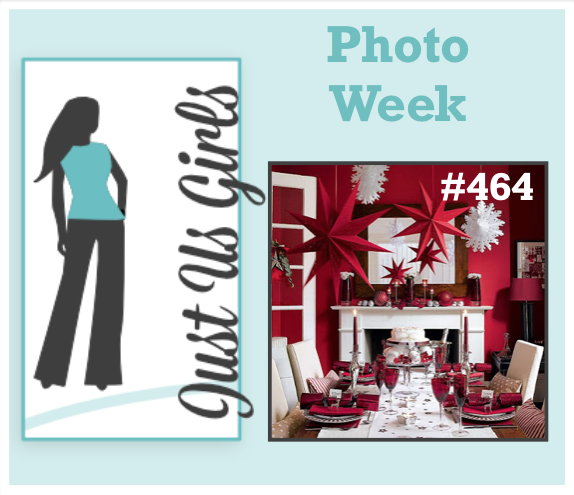 Vicki chose a fun photo for our Photo Week challenge at Just Us Girls! Love all that deep red color paired with white. So striking! I loved that deep red, and SU's cherry cobbler cardstock (do they still sell this color?) was the perfect deep red color. I die cut this beautiful mandala and the sentiment from white cardstock and spritzed them with shimmer. The sentiment was die cut four times and stacked. 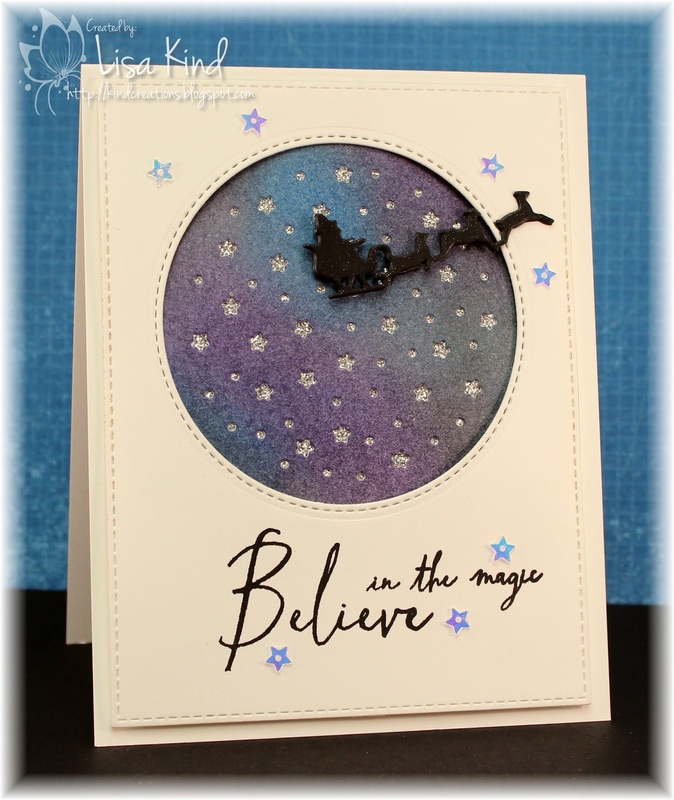 I added some white Nuvo drops to finish off the card. 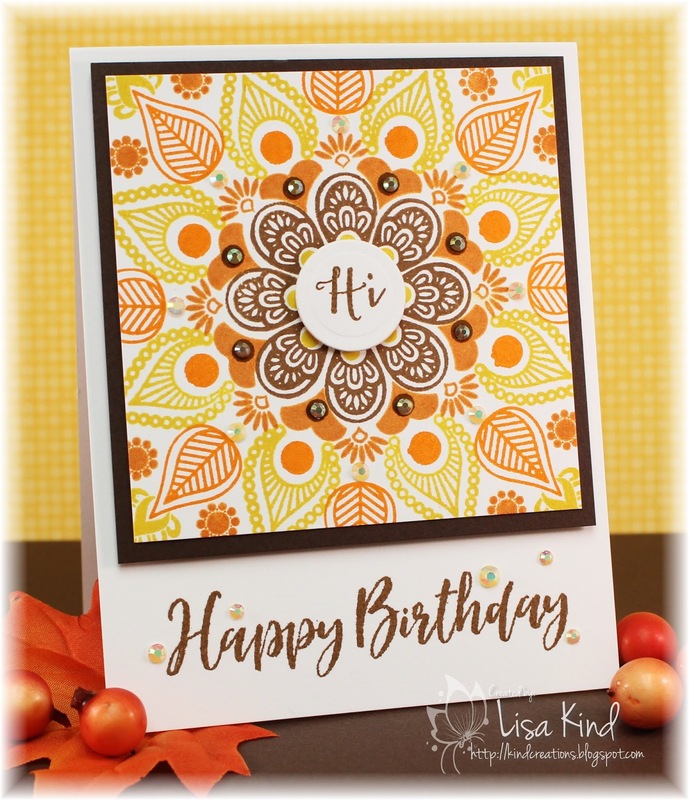 This die is very intricate, but die cut beautifully with the Gemini Jr. So glad I purchased it! 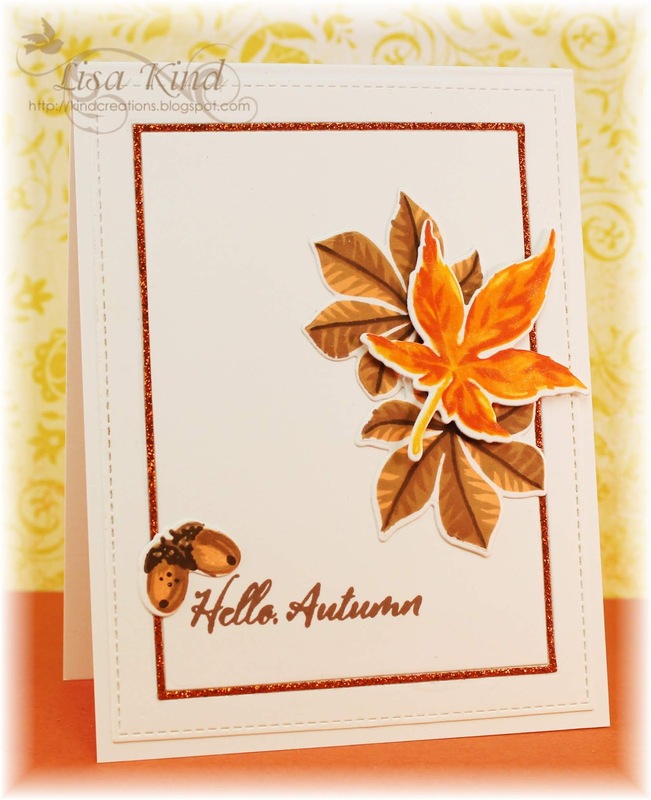 You can see more from the JUGs design team and our October guest, Linda, on the JUGs blog. This is Linda's last challenge with us for this month. She did a fabulous job in all of our challenges this month! Hi everyone! 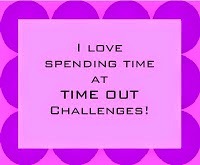 This week's Time Out Inspired by Words challenge is based on this quote. Perfect for this time of year. We are sponsored by Stamplorations for this challenge, and I'm using their Blossom Sprays #2 stamp on my card. This is a beautiful stamp! I enjoyed pulling out my copic markers and coloring. My inspiration for the colors came from a paper pack my friend Cheryl gifted me the other day. I was going to use one of the papers on the bottom of the card, but I just couldn't because it sort of clashed with the pretty image. I'll use the paper another time. I added Star Dust stickles on the centers of all the flowers and sequins. You can see more from the Time Out design team on the Time Out blog. 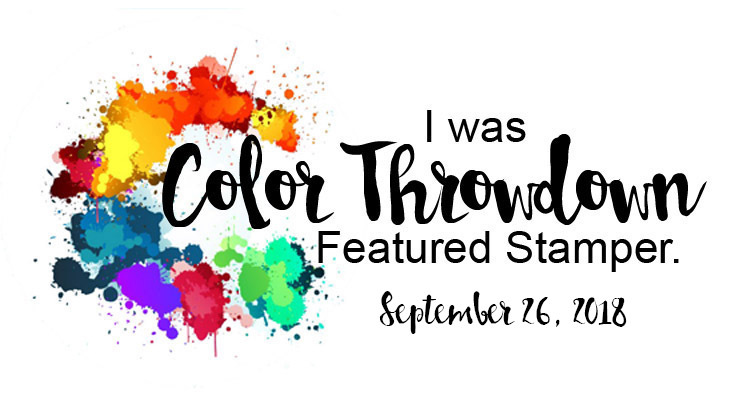 I'm also entering this into the Color Throwdown challenge. Hi friends! 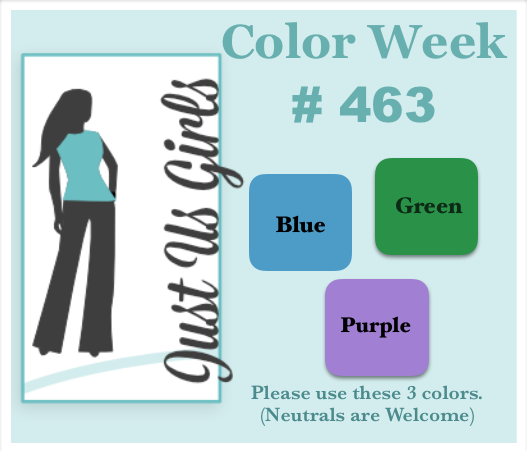 I'm the hostess at Just Us Girls this week for our color challenge. 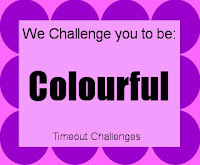 I chose blue, purple, and green for this challenge. I chose some Concord & 9th stamp sets to use for this card. 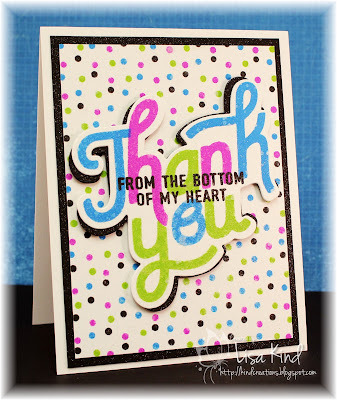 I stamped the thank you in the three challenge colors and the second part of the sentiment in black. 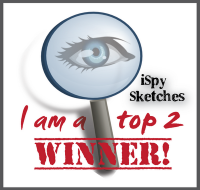 The background uses a turnabout stamp and I once again used the three challenge colors and black. The sentiment was die cut also in black and was matted offset so it would stand out a little bit more. I spritzed the entire panel with shimmer spritz (a little too much for my liking...it sort of splotched the sentiment). You can see more from the JUGs design team and our October guest on the JUGs blog. 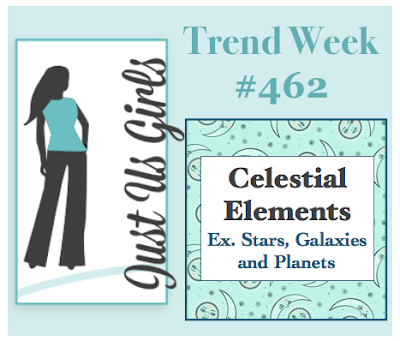 This week at Just Us Girls, Carol wants us to use celestial elements on our cards for Trend Week. This certainly is a trend right now! 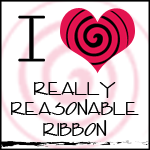 I die cut a stitched circle into a piece of white cardstock and stamped the sentiment on the bottom. Then I inked some distress inks on a piece of Bristol smooth white cardstock to create the night sky. I die cut that with a star die and backed it with some silver glitter cardstock. 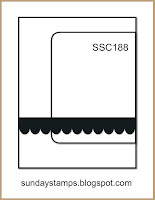 This was added to the card base and the main panel was adhered over that with dimensional tape. The santa's sleigh was die cut three times and stacked. There's some shimmer on that piece. That was added to the main panel. I finished it with some star sequins. 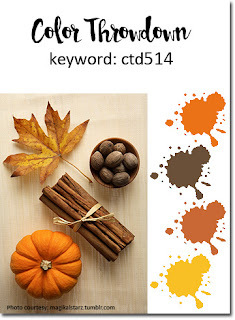 You can see more inspiration from the JUGs design team and our October guest on the JUGs blog. Hello! We have a new "Colorful" challenge over at Time Out, and I have a really colorful one for you! We are sponsored by Winnie & Walter for this challenge. I've used all products from them on this card. I started with this chevron stamp set that I've had for quite some time that hasn't seen any ink. Since our challenge is to be colorful, I chose a rainbow of colors to stamp the chevrons. I over stamped them with black ink for some dimension. I also stamped the sentiment in black as well. 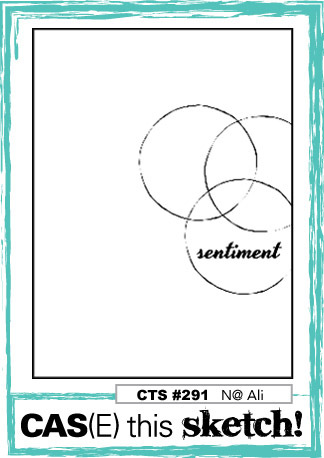 The die cut sentiment was die cut three times from black cardstock and stacked. I added shimmer to the die cut and Nuvo drops in coordinating colors. This should cheer someone up who is in need of hugs! Stop by the Time Out blog to see what Winnie & Walter is giving away to the winner and to see what the Time Out design team has created. Color Throwdown #514 Featured Stamper! Hi everyone! 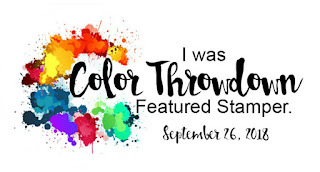 I'm really happy and honored to have been asked to be the Featured Stamper for this week's Color Throwdown Challenge! 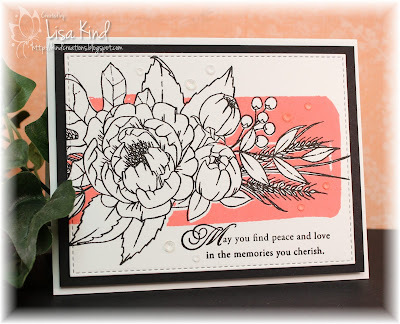 This card was the entry that made me the Featured Stamper! 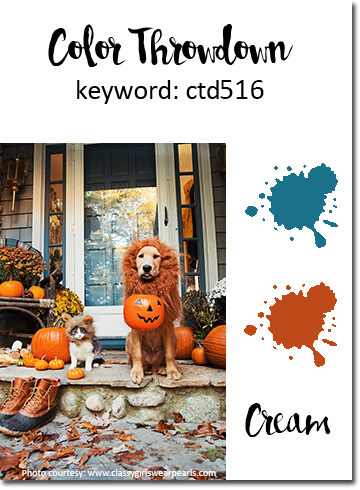 I was equally thrilled when I found out the colors for this challenge are fall themed and some of my favorites to work with! The day I got the email letting me know the colors, this new set from Gina K Designs was in my mailbox! I couldn't wait to try it, and thought the CTD colors would work well with it. I had to look at some examples (and of course channeled Jennifer McGuire) before I started just to get some ideas. I used inks from Altenew and Papertrey Ink and Gina K's wreath builder stencil to create this design. Thanks again to the girls at CTD! You can find their beautiful creations on the Color Throwdown blog. Hello there! 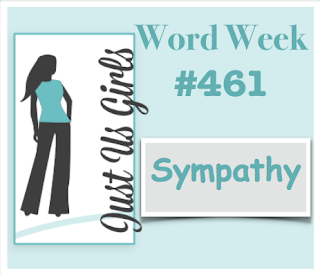 It's Word Week over at Just Us Girls, and Nancy chose Sympathy. 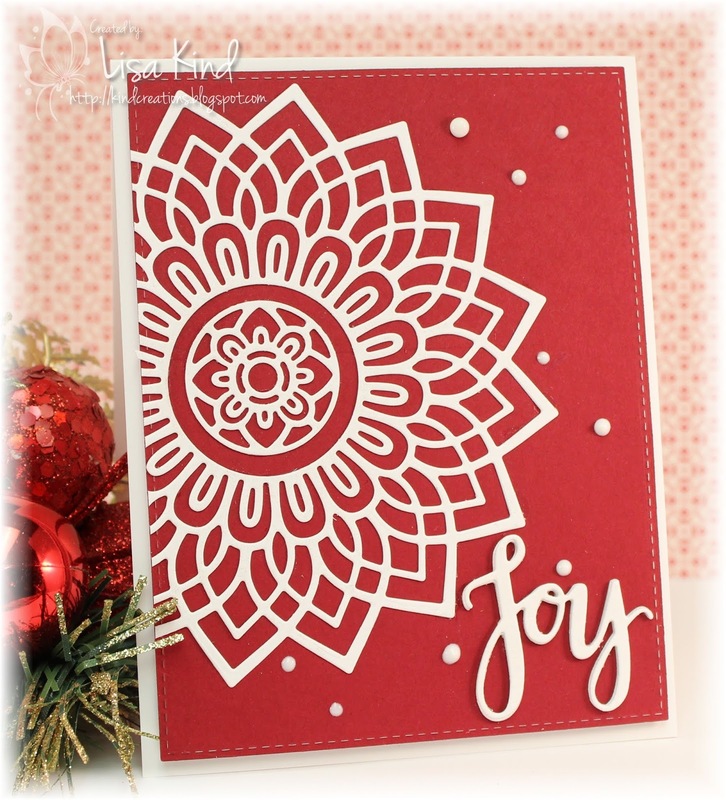 While this isn't the type of card stampers like to create, it's one we invariably need and hate to make last minute. I need to replenish my stash starting with this one. I was at my local stamp store the other day and saw a card made this way and I just had to recreate it. This is such a cool stamp set. The coral background is actually two stamps that fit around the floral bouquet. I stamped the right side with coral ink first. Then the floral bouquet in black, and finally the other coral piece. I die cut that piece with a stitched rectangle die and matted it on black cardstock. Then I mounted it on fun foam before adhering it to the card base. I added the sentiment and crystals. 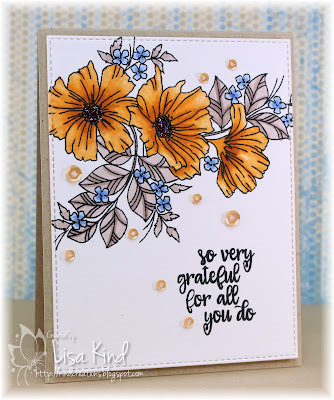 You can see more from the JUGs design team and our new guest for October, Linda Snodgrass, on the JUGs blog. Hey friends! My nieces and nephew took my hubby and I out for dinner last week to celebrate my retirement and to thank my hubby for watching my one niece's dog when she goes away. We had a lovely evening and I wanted to thank them. I already had this card made but needed another. 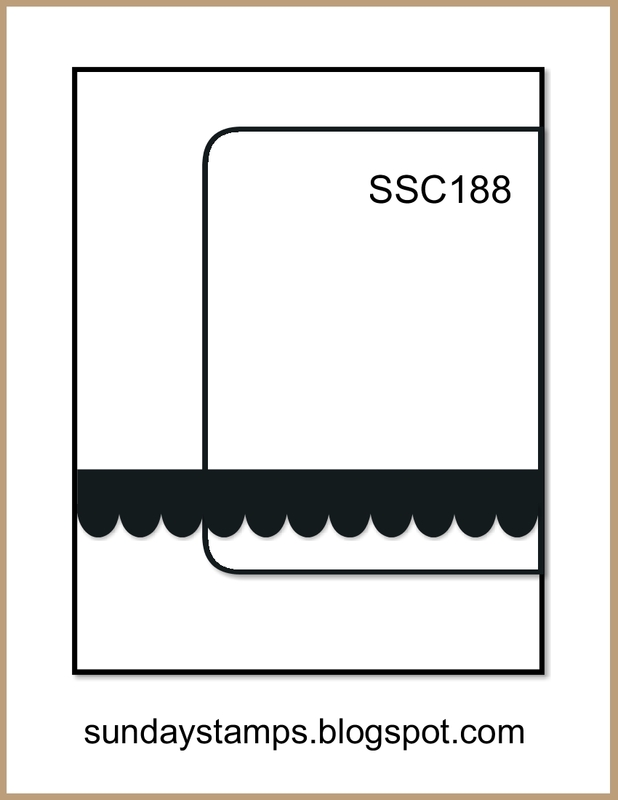 I'm loving the multi-step stamps that many companies are designing. I like to color, but these are so fast to make! 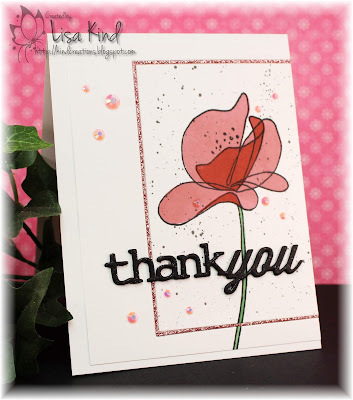 I stamped this lovely flower in black ink, then stamped the flower part in rose and red inks. The stem was colored in with a copic marker. I used a frame die to inlay a piece of pink glitter paper. The panel with the flower was sprayed with black paint. I added the sentiment with shimmer on it and crystals. I got my layout from the Sunday Stamps Challenge. Hello Autumn! It's getting a bit cooler here, and my summer flowers are starting to fade. I have to swap them out for some fall mums. I love autumn. It's my favorite time of the year! I also love leaf stamps. I have several, and this one is a new layering one. There are four different layers for each of the leaves, and three for the acorns. It's a Catherine Pooler stamp set and I used inks from her line as well. The main panel was die cut with a stitched rectangle, then I used a frame die that cuts this skinny little frame from the main panel. I used the same die on some rust color glitter paper and inlaid it into the main panel. There's some shimmer on the top leaf also. I used the current layout from CAS(E) this Sketch. I just noticed my sentiment is misplaced.